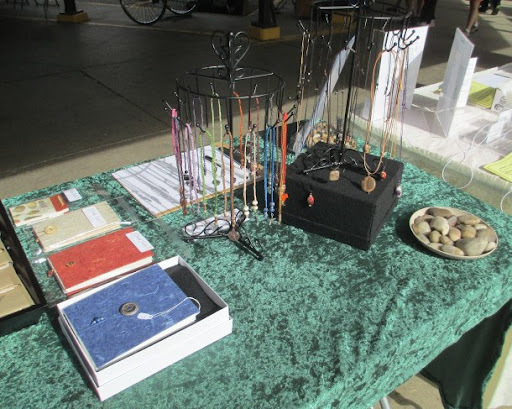 Last Sunday (September 9) I had the opportunity to have my first, official, by-myself booth at an event. I had a table at the 10th Annual Kerrytown BookFest! 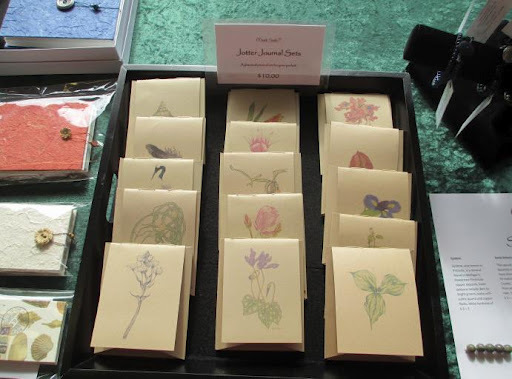 BookFest is a fantastic, local event focusing not just on authors and the literary arts, but also on the art and craft that goes into creating the physical books, including bookbinding, printing, and papermaking. As a librarian and artist, I couldn’t resist the combination! 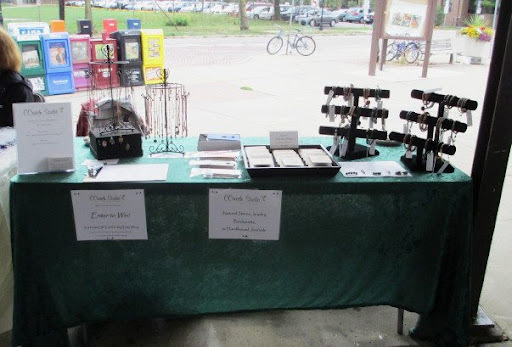 Held in the space where the weekly Kerrytown Farmer’s Market occurs, my booth was in a great location just outside of Sweetwater’s cafe, next to the information booths for BookFest. I was also right at the T-insersection of the first aisle of the market. I had consistent foot traffic all day, so much so that when I took a couple of brief breaks, my volunteer relief (both BookFest volunteers and also my husband!) reported that I had folks stopping by and browsing and asking questions. Great to hear! 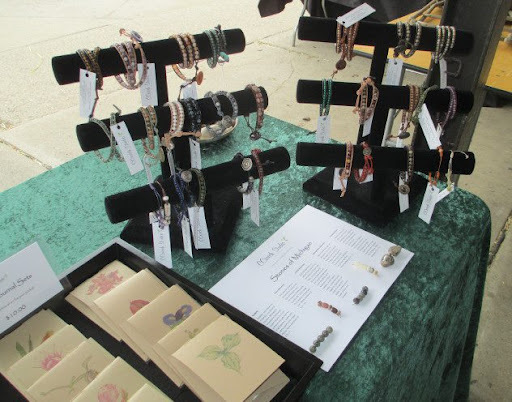 My offerings included the full range of items that I have in my Etsy shop, including wrap bracelets, jotter journal sets with prints of my original artwork on them, natural stone pendants, hand-knotted macrame gemstone bookmarks, and some handbound mini-journals. 1) A giveaway! I thought it would be a nice sign of appreciation to the folks who came by to have a chance to win a gift card to my shop. I put a sign on the front of my booth and had a sign-up sheet on the table for folks to win a $50.00 gift card to my Etsy shop. I had over 60 entries and picked the lucky winner (Ellery) during the week after BookFest. It included samples of five different stones, all from Michigan, with descriptions of the origins of each. Most Michiganders are familiar with the state stone – Petoskey Stone – which is a fossil coral, specifically Hexagonaria, found off of the shores of Lake Michigan. In the course of making wrap bracelets and researching the state’s natural history, I have discovered a number of other stones that I have started to use in my creations. These include Leland Bluestone, which is actually a glass/stone mix that resulted as a by-product of smelting in the 1870s; epidote, a gorgeous, green stone; mid-mitten alabaster; and kona dolomite (a fossil algae.) People were drawn into the booth and it gave them something to look at, and learn from, while browsing around. The content of the booth also includes the finishing touches, such as a nice table covering and display stands, professional signage (I printed pricing cards up and laminated them) as well as some decorative items to fill up the space so that the table doesn’t look too sparse. All of this contributes to creating an attractive, inviting, and professional display that speaks to the quality of your products and your business as a whole. I am thrilled to report that I had a nice number of sales at BookFest as well as some inquiries from folks about my presence at other local craft venues. I am very grateful for everyone who came out and who supported my first foray into craft booth selling! What did I learn? While having a craft booth is invigorating and exciting, and potentially lucrative, it is exhausting! I spent a great deal of time preparing my booth materials, making extra product so that I had enough to offer my customers, and then spending the entire day on Sunday setting up, staffing, and cleaning up the booth. It was a wonderful opportunity to talk with my customers and potential customers directly, get my products in front of people, and make some sales, but when I started to tally up my time spent on the whole endeavor, I began thinking about my pricing. I will explain more about that in my next post…stay tuned! Have you ever sold your wares at a craft booth? Do you do this frequently, or just at a select few shows per year? I would love to hear your perspective on the subject. Next Beauty of Bookmarks Treasury!